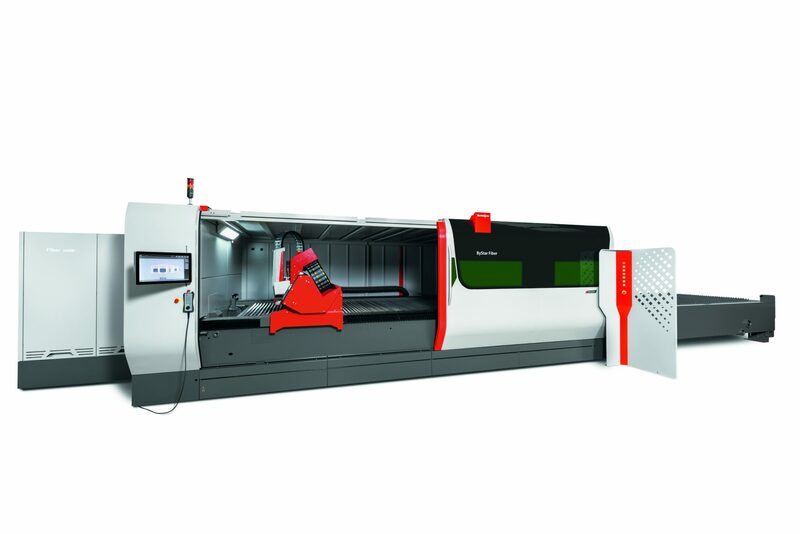 The high performance ByStar Fiber laser cutting system has been designed from the ground up to meet the demands from high-speed fiber laser cutting as well as cutting capabilities into the 1.180-inch thick plate range with consistently high cutting quality. With its uncompromising high-end performance, the ByStar Fiber is aimed at users who want to rely fully on fiber laser technology. Users who will in future cut their entire range of orders using the fiber laser: from stainless steel, through to aluminum and mild steel, right up to non-ferrous metals, such as copper and brass. With its triangle cutting bridge design providing exceptional rigidity and accuracy, the ByStar Fiber is able to deliver dynamic speeds and acceleration while utilizing X/Y linear drive technology. The new ByStar Fiber platform enables Bystronic to meet the demands from higher fiber laser powers well into the future, and with the lowest possible operating costs and low maintenance requirements. The great innovation of the ByStar Fiber lies in the single-mindedness with which Bystronic developed this fiber laser. Right down to the detail, the machine is geared towards fiber laser cutting, without compromises, regardless of whether high cutting dynamics, seamlessly tying in automation solutions, intelligent sensor technology, or the integration into modern software systems. All this is possible with the ByStar Fiber. A new machine design with an innovative cutting bridge enables previously unachieved dynamics of the fiber laser, even when cutting complex contours. The outstanding cutting quality is ensured by the ByStar Fiber’s newly developed control, which automatically regulates the laser power, speed, and focus. 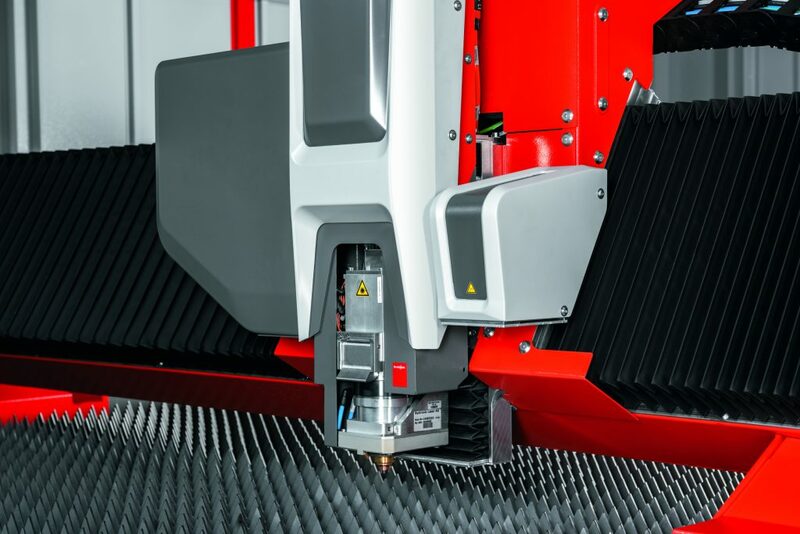 Bystronic has further increased the fiber laser’s versatility by providing access to the cutting area over the long side of the machine. The large sliding door allows users to insert express jobs and residual sheets at any time, even when large-scale jobs are running — simply interrupt the large-scale job, open the door, insert the residual sheet, and go. This is a tremendous advantage, particularly for job shops that need to be flexible. Operating the ByStar Fiber laser 10kW is as simple as using a smartphone for everyday tasks, because Bystronic has equipped the ByStar Fiber with a newly developed user interface. ByVision Cutting unites all the important functions associated with laser cutting on a full 22-in. HD touch screen. This allows the user to carry out all the cutting preparations with just a few swipes of the finger — sort the job list, assign cutting parameters, and define the automation mode. Then start the process and the ByStar Fiber gets going. With ByVision Cutting, the operator has many more possibilities to interactively intervene in the cutting process. For example, in order to adapt cutting parameters in case of deviating material characteristics: Simply click on the current cutting plan on the touch screen, define new parameters, and resume the cutting process. The whole process requires no more than three clicks. The goal of ByVision Cutting is to offer the user every possible freedom on an intuitive user interface, without constraining him with complex operating procedures. In principle, laser cutting is about the following: load a metal sheet, start the machine, and cut. However, the users’ environments are very diverse. One customer sometimes operates the machine manually in order to process continuously changing jobs. Another customer manufactures fully automatically with loading and unloading systems and an integrated material warehouse. ByVision Cutting was developed in order to cope with this variety using the ByStar Fiber. When purchasing a new ByStar Fiber, it can be now be equipped with an integrated rotary axis. The operator simply inserts the tubes that are to be processed through a hatch on the side of the machine housing or directly through the sliding door on the long side of the machine. Thanks to the sliding door on the long side of the cutting area, ByStar Fiber users always have unlimited access to the parts that are to be processed. This facilitates both the set-up for tube processing jobs and the fast unloading of the completed cut parts. The standard version of the new tube processing upgrade enables tubes with a diameter of between 1.25 inch and 12.5 inch and a variety of lengths to be processed. The standard scope of delivery also includes the Tube Cutting software module. This module is an expansion for the BySoft 7 programming software. It allows users to design parts for tube processing, input existing CAD files, and edit them. Thanks to the intuitive software design, cutting plans for tubes are created in no time at all. In order to process longer tubes, Bystronic offers a mobile upgrade, the rotary axis box. The rotary axis box is easily attached to the ByStar Fiber. It enables tubes up to a length of 10 feet to be fed in through the hatch on the side of the machine housing for processing. The rotary axis box enables the precise positioning of long tubes and provides reliable shielding against laser radiation. When the rotary axis box is not in use, the machine operator can detach it in just a few simple steps. When laser cutting tubes up to 20 feet in length, users can expand the rotary axis box with an additional extension box. Upon request, Bystronic offers this extension box as an upgrade. Insert tube, start laser, unload completed part. Laser cutting of tubes using the ByStar Fiber is now this simple. The Bystronic ByCockpit provides real-time information on sheet metal production processes. 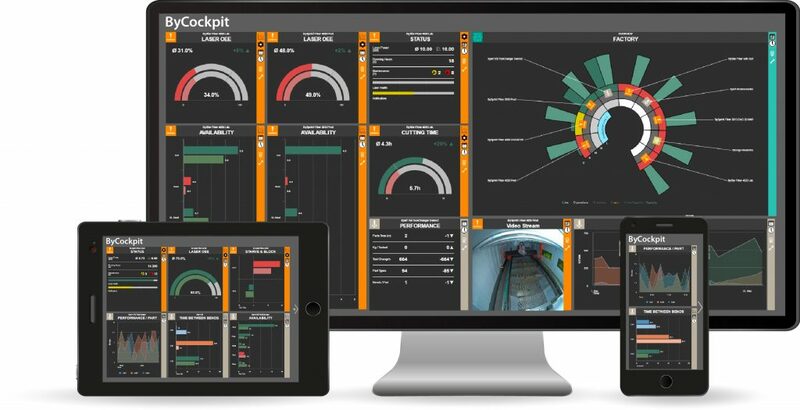 ByCockpit visualizes selected key indicators regarding machine performance and manufacturing efficiency. During the development of the ByCockpit, Bystronic’s IT specialists worked with a number of sheet metal processing companies. Their number one question was: How do users retrieve information from their machines in order to analyze and improve their production processes? For many sheet metal processing companies, the process of retrieving data from their machine systems and subsequently translating it into usable information is very tedious. They must deal with price pressure, short delivery deadlines, and increasing quality demands. This translates to mean that sheet metal processing companies nowadays are forced to respond quickly and to constantly improve their production. ByCockpit helps reveal deficiencies in the production processes. The ByCockpit runs on virtually all mobile devices – laptops, smartphones, or tablet computers. Just like any other app, the ByCockpit is simply installed on the designated devices. When the ByCockpit is launched, a selection of approximately 30 widgets is available. Users can switch between pre-defined overviews and the favorites view. In the favorites mode, users can individually configure their ByCockpit. Using the drag and drop principle, they select the widgets that provide the required overview of their individual machine systems. One of the ByCockpit’s numerous widgets is the Sunburst view. It is a circle diagram that displays the condition of the entire production at a glance. Green bars denote machines that are currently in operation. Red bars show machines that are idle. And blue bars combine all the systems that are connected to form an assembly line. With a click, users can switch to the overview for the laser cutting process step. Here, the status widget displays the output (kilowatts) with which the laser is cutting, the total operating hours of the system, and whether the next service should be scheduled. Another widget in the laser cutting overview displays overall equipment effectiveness (OEE) which is determined by such factors as machine availability, parts output, and the quality of the cut parts. 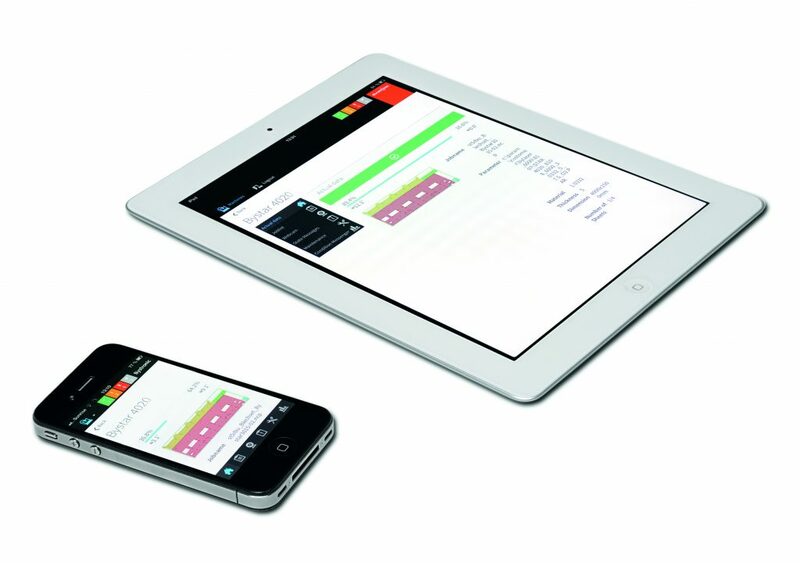 In addition, the OEE widget allows a direct comparison to be drawn to previous production cycles. The next click leads to the overview of bending jobs. Here, the performance widget provides information about the number of bent parts produced, the time required to produce them, and the number of tool changes. This overview allows the bending set-up times to be optimized. The parts performance widget determines the development of the bending time for parts over time. A diagram provides a daily overview and thus reveals deviations in the production processes. It also enables a comparison to be made between manual and automated bending. The widgets in the storage overview provide detailed information about the materials in stock — what raw materials are in the warehouse and in what quantities. The overview lists all the material with weight and purchase value. In addition, it enables direct comparisons to the inventory at earlier points in time. For more information, visit bystronicusa.com, or to contact by e-mail, sales.us@bystronic.com.